Energy efficiency is a win-win-win for the United States. It saves homeowners money, it puts Americans back to work, and it helps avoid the most catastrophic consequences of climate change. But energy efficiency investments are tough for some people to make because they typically involve relatively large up-front costs for benefits spread into the future. The Weatherization Assistance Program exists to help make sure all Americans share benefits of energy efficiency. After a slow start, the Weatherization Assistance Program gained momentum and on Thursday, September 27, 2012 weatherized the 1 millionth home just nine months after passing the 600,000 mark. This achievement marks a major milestone. 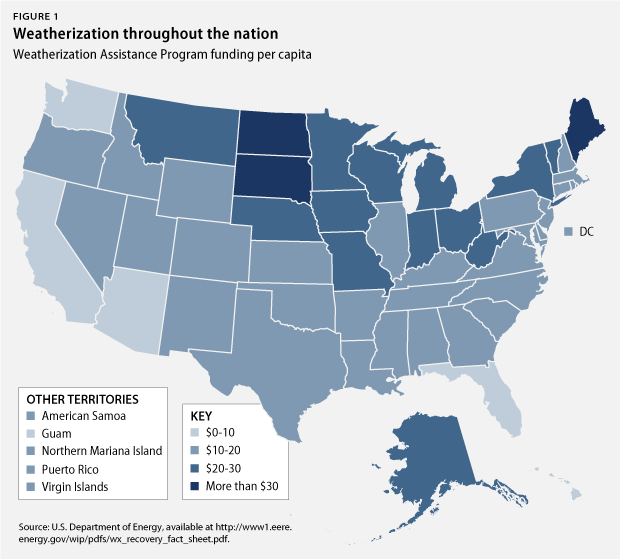 Across America, the Weatherization Assistance Program has been a success. While this is a great achievement for President Obama and the Department of Energy, the real beneficiaries are the families who have had their homes retrofitted. Any household at or below 200 percent of the poverty line qualifies to apply for retrofit services. Although 38 million households are eligible for weatherization services, priority has been given to families with children and homeowners who are elderly or disabled. The Weatherization Assistance Program also has environmental benefits. Energy use in homes, offices, and industrial facilities is a leading contributor to climate change. According to the Environmental Protection Agency, buildings in the United States account for nearly 40 percent of the nation’s total energy use and 65 percent of electricity consumption. Because the construction, operation, and maintenance of buildings involves large amounts of energy, water, and other resources, buildings produce 30 percent of the greenhouse gasses emitted in the United States each year. The purpose of the Weatherization Assistance Program is to increase the energy efficiency of homes owned or occupied by low-income persons, reduce their total residential expenditures such as heating and cooling bills, and improve the health and safety of families. For three decades, the United States has operated the program under the Energy and Conservation and Production Act of 1976, but President Obama’s allocation of $5 billion under the American Recovery and Reinvestment Act to the Weatherization Assistance Program represented a five-fold increase compared to fiscal year 2008 funding levels. The Department of Energy provided the funding to states, territories, and tribal governments who could manage the day-to-day details of the program. State governments funded a network of local community agencies, nonprofit organizations or local governments to provide the weatherization services. 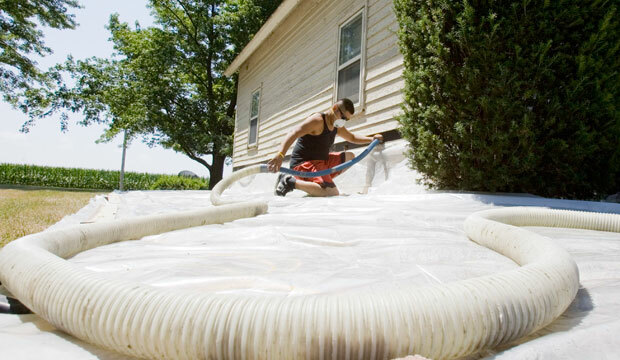 Throughout the entire country residents have benefited from weatherization investments. One specific region does not stand out as the main recipient as Figure 1 illustrates WAP funding per capita. Although the weather in North Dakota and North Carolina are different, weatherization of low-income housing in those states still helps families save on their energy bills. For a family struggling to make ends meet, weatherization services can help them reduce their energy consumption by up to 35 percent—saving them more than $400 on their heating and cooling bills in the first year alone. When a low-income household is spending upward of 15 percent to 20 percent of their total monthly income on energy costs—money that could be otherwise used to buy groceries or pay for education or health care costs—the weatherization of households is a clear benefit. In fact, in 2010 the program saved low-income families $2.1 billion. But the Weatherization Assistance Program was also designed to deliver on the promise of creating jobs and benefitting communities across the country. The press focused on negative, headline-grabbing stories about green jobs and the weatherization program in the beginning months when the program was ramping-up. Unfortunately, the follow up stories highlighting the successes of this program didn’t garner much attention. If reporters had followed up they could have told their readers and listeners that state governments have been using a network of over 1,000 local agencies and more than 4,000 private contractors while employing an average of more than 12,000 workers per quarter to perform weatherization services across the country. One specific organization that weatherizes houses in Colorado is Veterans Green Jobs, a nonprofit founded in 2008 that’s committed to finding military veterans jobs in the green economy—jobs that serve the community and the environment. By receiving funding from the Department of Energy, veterans were trained and employed to weatherize homes and businesses across Colorado. The Weatherization Assistance Program not only created jobs desperately needed in the construction industry, it also provided a boost for American manufacturing and small businesses. 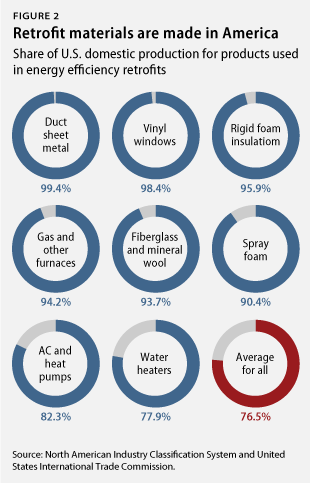 More than 89 percent of the materials used in home retrofits are made right here in America. In all cases, except refrigerators (which are 62.3 percent domestically produced), retrofitting homes exceeded the national average for domestic share of all manufactured products used in the United States of 76.5 percent. Recovery Act funding went through these channels to stimulate local economies, employ thousands, and create demand for American-made supplies. The investment it took to ramp up the Weatherization Assistance Program was a down payment on putting America back to work, creating thousands of American construction and manufacturing jobs that not only improved more than 1 million homes but will strengthen our nation for many years to come. This remarkable success proves that weatherization services can be a source of sustained job creation in America and further solidifies the argument that the Weatherization Assistance Program is a tremendous accomplishment for President Obama and the Department of Energy in tough economic times. Across America, the successful implementation of the Weatherization Assistance Program under the Recovery Act increased the demand for energy-saving products and services, created thousands of skilled jobs, and helped families reduce waste and save money. In short, the Weatherization Assistance Program has put people back to work building a stronger America. Richard W. Caperton is the Director for Clean Energy Investment at the Center for American Progress, and Adam James and Matt Kasper are Special Assistants for Energy Policy at the Center for American Progress. Weekly Clean Energy Roundup: January 26, 2011, Sustainable Business.com, available at http://www.sustainablebusiness.com/index.cfm/go/news.feature/id/1878. U.S. Department of Energy, “Energy Department Announces Major Recovery Act Milestone: 600,000 Homes Weatherized Three Months Ahead of Schedule,” December 15, 2011, available at http://energy.gov/articles/energy-department-announces-major-recovery-act-milestone-600000-homes-weatherized-three. David Danielson, “EERE Celebrates Completion of 1 Million Weatherized American Homes,” Energy.gov, September 27, 2012, available at http://energy.gov/articles/eere-celebrates-completion-1-million-weatherized-american-homes. U.S. Environmental Protection Agency, Green Buildings, available at http://www.epa.gov/oaintrnt/projects/. U.S. Department of Energy, “Weatherized Homes Saving Money for Families Across the U.S.” January 6, 2012, available at http://energy.gov/articles/weatherized-homes-saving-money-families-across-us. U.S. Department of Energy, “Weatherization and Intergovernmental Program,” 2010, available at http://www1.eere.energy.gov/library/pdfs/48098_weatherization_assisprog_fsr4.pdf. Weatherization Assistance Program Technical Assistance Center, “Program Overview,” available at http://www.waptac.org/WAP-Basics.aspx. Jorge Madrid and Adam James, “Home Weatherization Grows 1,000% Under Stimulus, Creating Jobs, Saving Low-Income Families $400 a year,” Climate Progress, September 19, 2011, available at http://thinkprogress.org/climate/2011/09/19/321954/home-weatherization-grows-1000-under-stimulus-funding/. Bracken Hendricks and Tom Kenworthy, “HOME STAR: Putting Americans Back to Work,” (Washington: Center for American Progress, 2010), available at http://www.americanprogress.org/issues/green/news/2010/02/23/7287/home-star-putting-americans-back-to-work/.